Is it possible to contact the founder, CEO, chairman and president of FedEx directly? It is indeed. An email address, fax number, telephone number, and a physical address are all available if you want to get a message to CEO Fred Smith. He's easily accessible via all these means of communication. If you want to contact the office of Fred Smith, but not him directly, you can contact his assistant. FedEx has demonstrated its high regard for social media. 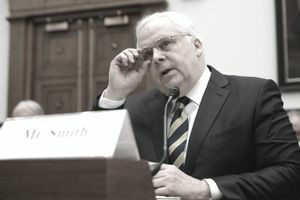 In a rare display of transparency, if you post a message for Fred Smith on FedEx's Twitter or Facebook accounts it is likely to get noticed and passed on. Why Isn't This Information a Deep, Dark Secret? It's easy to understand why consumers might want contact information for corporate CEOs. It's not as easy to figure out why CEOs would want consumers to have that contact information. In the age of the empowered consumer, unlimited access is not just a customer expectation. It's often a demand. Consumers want what they want when they want it. From town hall meetings to street protests to Twitter rants, consumers have unprecedented access these days to air their uncensored grievances in an unlimited number of public forums. And, any message made public is just a tweet, share, or repost away from becoming a viral sensation — or a public relations nightmare. It's in every company's best interest to encourage people to communicate directly (and privately) with a company representative rather than vent on social media. Providing easy access to the CEO is much more manageable than uncontrollable access to the masses. The most common reason for a consumer to take the time to communicate with a company CEO is that any communication that reaches the CEO (or the CEO's personal assistant) will generally be noticed. Nine out of ten times it will receive a response and, hopefully, get people in key management positions to take action to resolve the problem. Even the busiest CEOs of the largest companies will assume that any communication that manages to reach their desk, inbox, or social media account is important enough to read. CEOs understand that consumers like to feel important. And, a customer most likely won't reach out to a company CEO until they've already contacted other employees that have made them feel unimportant. What Happens After You Contact a CEO? Regardless of whether your communication is positive or negative, it will typically move along certain channels after it's received by a CEO. It usually doesn't stop at the CEO's desk. A stakeholder communication might find its way into an employee newsletter as an example of a best or worst practice, along with encouragement to repeat — or, not repeat — that practice. Positive communications fielded by the CEO will often make it onto the corporate website, into employee HR files, and even into corporate training programs. If a message is particularly extraordinary or heart-wrenching, it might even find its way into a mass media marketing campaign starring the message sender.